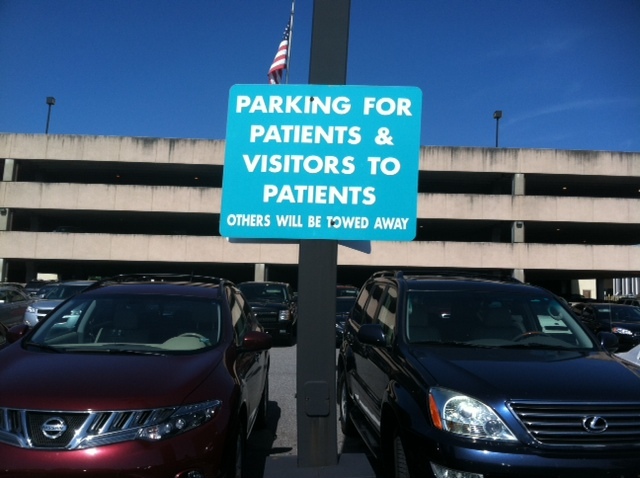 With the doctors having a better lot, who else is going to park here? Nothing else is around. The sign must be to stop those trying to exercise by hiking two blocks to the shopping center rather than park in that free lot. If people work out, they might get better and not need doctors. Selfish jerks! Note to the humor impaired: I'm kidding! They must have had an "incident" in the past that made them feel it was necessary for the sign lol. I'd rather not know what. Ah ha ha ha ha I LOVE it. Love those weird and nonsensical signs. I think peeps that like to write those sign think they're verbally intelligent or something. What's with the Linkie-thingies? Yes, that is very strange. Makes me wonder who was abusing the parking spaces and for what purpose? One really has to stop and wonder who writes these signs!!! LOL. Thanks for hosting and have a grat week. Gotta love road signs. And I especially enjoyed your Note to the humor impaired! Happy WW! I don't see any patients or visitors parking there, though. Just cars. The sign is a little over the top. Rules are usually put into place because someone made them put it into play. We have some rules like that at work. In our handbook it says, "Music may not be listened to." Well my co-worker listened to Rush Limbaugh really loudly! None of the other teachers could concentrate. I guess not because their blood was surely boiling. Rush is not on the side of teachers, so I have to wonder about the intelligence of a teacher who buys into his crap. Here's my thought: How would the person in charge of having vehicles towed know who was driving what and where they were going? All this sign does, if anything, is scare the paranoid types away. By the way, that parking garage or whatever it is in the background could use a pressure washing. The person doing ot could make some big buckaroonies! The wording is rather strange. I wonder who thinks up this stuff. Lol. It does make me wonder who was taking advantage of that lot that they felt the need to put up such a sign! Silly Sunday: Share it Maybe?